Dr Seuss books have delighted children for generations, so they need no introduction. How could you not fall in love with all the adorable characters and Dr Seuss's goofy rhymes? Many of Dr Seuss’s books are great for beginning readers as they only contain a small number of original words that are arranged in all sorts of silly and creative sentences. Once children realise they can read most of the words, they will quickly devour the whole book! It’s a fantastic confidence booster for struggling and reluctant readers. The rhyming and repetition in Dr Seuss books not only make them fun to read aloud but are also key to making them excellent resources for developing children’s speech and language skills. 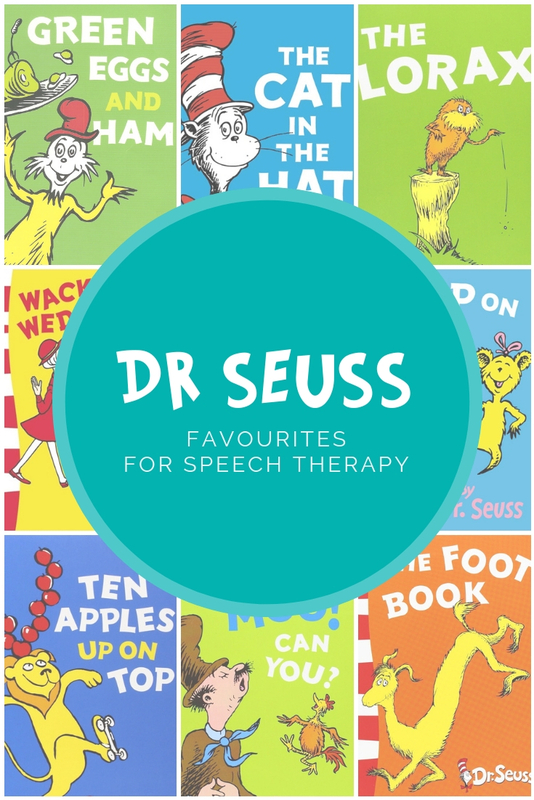 Here are my favourite Dr Seuss books to use in speech-language pathology sessions. What are your favourites? Green Eggs and Ham consists of less than 50 words. But the repetitive nature makes it ideal for targeting rhyme and grammatical elements such as subjective pronouns (I, you), objective pronouns (me, them) and modals (could, would, will, may). 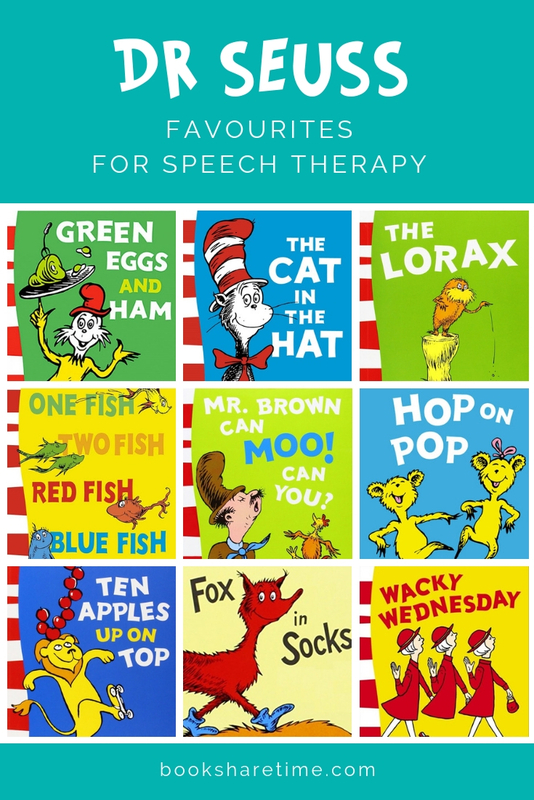 Click here for more speech and language goals that can be targeted using this Dr Seuss classic. The rhyming text makes The Cat in the Hat a delight to read aloud and will capture children’s attention as they listen to the charming cat’s crazy antics. The repetitive text with basic vocabulary will help to develop children’s language skills, as well as provide beginner readers with confidence as they decode the words. The story is packed with words containing the /k/ sound, so it’s a good choice for children working on this sound in word-initial and word-final positions. For more ideas on speech and language goals to target using The Cat in Hat, click here. The Lorax by Dr Seuss is another delightful rhyming story with a strong moral of the importance of taking care of our environment. The text and accompanying illustrations provide a vivid setting description before and after the destruction of the Truffula Tree forest. The new and interesting plants and creatures create plenty of opportunities for children to practice their describing skills. Click for further speech and language targets using The Lorax. Dr Seuss’s The Foot Book uses rhythm and rhyme to teach young children about opposites. It explores a range of descriptive, location and quantity concepts through repetitive text and engaging illustrations. The Foot Book would be the perfect choice for children who are practising their /f/ sound in word combinations (e.g. left foot, right foot, wet foot, dry foot). Click here to see more possible speech and language targets in The Foot Book. One Fish, Two Fish by Dr Seuss explores a range of antonyms and basic concepts, such as new/old, fast/slow, and thin/fat. It’s excellent for targeting adjectives, particularly at the start of the story when the little boy is describing the different fish he sees (e.g. this one has a little star, this one has a little car). It's also ideal for children who are practising their /f/ sound in word combinations (e.g. black fish, blue fish, old fish, new fish). See more speech and language goal suggestions here. Ten Apples Up on Top by Dr Seuss is a fantastic book to teach young children to count to ten. It can also be used to teach a range of quantity concepts (e.g. many/few, most/least, more/less). It's great for teaching the location concept ‘top’ as the word can be modelled many times throughout the story and can be followed by fun activities, such as seeing how many beanbags we can put on top of our heads. Click here to explore more speech and language targets using Ten Apples up on Top. Fox in Socks is quite a tricky book to read aloud due to all the tongue-twisters, but excerpts can be used to target speech and language skills. Teach regular plurals through focusing on scenes such as the chicks carrying bricks, blocks, and clocks; and the beetles going to battle. The tongue twister about Sue’s socks is excellent for targeting the /s/ sound in word-initial position. The Luke Luck likes lakes scene is perfect for the /l/ sound in word-initial position. Plus the beetle battle story can be used for /l/ in word-final position. Click here for other possible speech and language targets using Fox in Socks by Dr Seuss. The repetitive use of basic and short vocabulary (CVC words) throughout Hop on Pop makes it ideal for targeting a variety of speech sounds. The colourful and exciting illustrations closely match the text, thereby supporting children’s comprehension. This is also a fantastic book for teaching prepositions, such as in, on, up, down, as they are repeated a number times throughout the story, and the illustrations further reinforce the location concepts. The list of speech sound that can be targeted using Hop on Pop can be found via this link. Mr Brown Can Moo is a silly rhyming book that encourages children to imitate sounds through the use of onomatopoeia. It’s great for very young children who may have limited sounds in their speech inventory. Practice simple words like “hoo hoo” and “moo moo”. This book can also be used to encourage reluctant early readers to have a go at reading as the repetitive phrases like “Mr Brown can go like a….” and "how about you?" will give them the confidence to keep reading. Click here for more speech and language goal ideas using Mr Brown Can Moo. Wacky Wednesday is an interactive book that not only suits beginner readers but is also a fun story to read aloud to younger listeners. The story is written in short rhyming sentences and encourages children to find an increasing number of semantic absurdities on each page. It’s basically a whole book of “what’s wrong with this picture?” pages, which is great for developing children’s language skills as they describe what they see on the pages. The book provides frequent models of the subjective pronoun ‘I’ (e.g., “I was late for school. I started along. And I saw that six more things were wrong”), so it could be a good choice for children who struggle with this pronoun. It also contains lots of words beginning with /w/ for children who are learning about this sound. See the many more speech and language goals to target using Wacky Wednesday here. ‘Oh Say Can You Say Di-no-saur?’ is a non-fiction book in the Dr Seuss series that contains everything we love about Dr Seuss books. The rhyming prose, silly phrases and humorous illustrations will make learning about dinosaurs heaps of fun! There are lots of opportunities to practise describing all the funny-looking dinosaurs, and kids will love trying to say those long dinosaur names by breaking them into syllables. There are many new words to discover throughout the book, like ‘fossils’, ‘herbivore’ and ‘zucchini’. Luckily, a glossary at the back provides definitions for any words that may be unfamiliar to the child. See more speech and language goal suggestions here. The Nose Book is a brightly coloured rhyming book describing noses of all kinds, colours, shapes, sizes and functions. Children will love labelling the various animals they see on the pages and describing the differences between the animals’ noses. This book could also be a great addition to lessons focusing on our senses. The repetitive use of the word ‘nose’ makes this an ideal choice for working on the speech sounds /n/ and /z/. For more ideas on speech and language goals to target using The Nose Book, click here. Click here for more books by Dr Seuss. Book Share Time has convenient filtering options to help make finding the perfect children's books an effortless process. Filter through various speech and language goals, such as parts of speech, themes, basic concepts and more. It's free and easy to use - check it out!